Welcome to the Annual Buggy Days Festival!! Barnesville Buggy Days is the city’s benchmark festival, celebrating Barnesville’s historic heritage as the “Buggy Capital of the South” during the late 1800’s and early 1900’s. With original events such as hog calling, wagon pulling, choir competitions, and even a fiddle contest, Buggy Days got its start in November of 1974. Since then, it has been featured in Southern Living Magazine, and its parade has even been granted the title of the “Longest Hometown Parade in the South”. Held every third weekend in September, the Barnesville Buggy Days Festival is dedicated to furthering the camaraderie of family, community, and tradition, with the exhibition, sale, and charitable exchange of local, handcrafted, handmade goods from around the southeast. Every year, nearly 200 artisans and crafts-persons sell their handcrafted wares right in the historic heart of Barnesville. With original antique Barnesville Buggies on display, it is truly a hometown sight to behold. And, each year our local civic organizations pair with a local and delectable food vendor to provide some of the most flavorful treats you can possibly get your hands on. Craft and Food Booth Spaces are available on first come, first served basis. While we try to make every effort to provide the same space to our returning vendors, spaces cannot be guaranteed. . We ask that you please fill out your applications as soon as possible. Also, please do not make a payment on your booth space until you have received an approval contract from the Buggy Days Committee. Thank you in advance! Food Vendors are limited to our local Civic Organizations!! 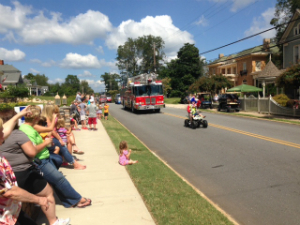 The South’s Longest Hometown Parade! Stretching out at just over a mile of beautiful mayhem and colorful sound and fury, the Buggy Days parade features themed floats, epic horses of all sizes, a host of civic groups and local organizations, and yep, you guessed it, buggies! The parade always begins at 2:00 PM on Buggy Days Saturday, leading off with our Grand Marshal—the Citizen of the Year. This year, the 45th Annual Barnesville Buggy Days Parade will be the longest, loudest, and brightest it’s been in its entire existence. 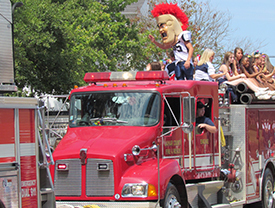 Line-up and staging for the parade begins at 12:00 NOON at Summers Field and the Gordon State College Parking Lot. Details for float, horse, and band entry are in each application. 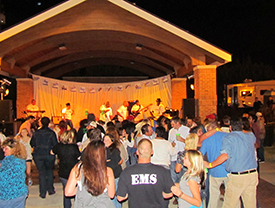 Held at the fabulous Ritz Park Amphitheater in downtown Barnesville, The Chamber of Commerce, along with a host of our incredible sponsors invite you to the annual Friday night Buggy Days Concert. An annual tradition gowns, glitter, and goddesses of all ages. This fabulous event is held the weekend before Buggy Days at the Lamar County High School Performing Arts Center. This year’s event will take place on Saturday, September 14, 2019—and open to ladies of every age and from all surrounding counties! How much are vendor spaces? For arts and crafts vendors, the booth fee is $125. For general food vendors, the fee is $100. **Remember** Food vendors must be associated with a local non-profit organization. How big are your spaces? What do I do if I end up needing additional space? The vendor spaces are 12×12 and located on asphalt surfaces. We make every attempt to assist vendors with spacing needs, however due to the number of vendors that participate in Buggy Days sometimes additional space cannot be accommodated. Therefore, we encourage all of our vendors to ensure before setting up that their total booth display is 12×12 or less. This is a two day event. What do I do with my merchandise after the first day? What is the plan for adverse weather? Since this is a two-day event, vendors have 1 of 2 options. Vendors may pack up their merchandise and display items and bring them back the second day or they may cover their items and leave them at their booth overnight. In the event of rain and/or adverse weather conditions, we cannot offer a refund for any booth space. ex: Kristen had a corner space at last year’s festival and wants the same space this year. She sent her application in late and did not send any pictures of her craft. Robert had a space next to Kristen’s last year, but this year he requested an additional space. He sent his complete application in on time and ended up being placed in Kristen’s space. I am having an issue with my space, another vendor, etc. Who should I contact? If you are experiencing an issue with your space, another vendor, or have any other question or concern, please contact a member of the Buggy Days volunteer team. There will be many of them running around and they will all be wearing neon orange shirts. I have heard that vendors will be allowed to participate in the Buggy Days concert. How do I sign up? 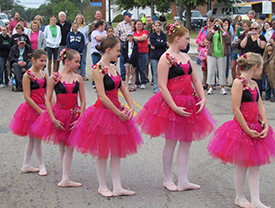 The Barnesville Buggy Days is a family fun festival that is rich in the history of the community. There is truly something for everyone. The week starts off with a Beauty Pageant, music, arts and crafts, a parade, good food, and so much more. Be sure to check out the complete brochure for times and details.